Huge sun-drenched beach and hundreds of vehicles on the sand. It looked exactly like Rose Lake in Senegal. The start area of 4th rally stage reminded the contestants of this stamping and sacred ground of Dakar finish, which was African by 2009. For more appeal the race officials decided to make a group start in all categories – trucks started in two. The first to the start line came trucks of Eduard Nikolaev and Federico Villagra. Despite the ploughed sand by the cars both immediately took the maximum speed and in a minute disappeared in a misty mirage of the coast line. Already yesterday there were talks that special would be the most difficult in Peruvian part of the route. Confirmations of it were coming after 200-kilometer of the special. The route developers had told on a reason that today much would depend on a navigator. One of the traps awaited crews at a huge and difficult for taking dune on 227-kilometer of the route. Logically the road-book obligatory control point laid on its top. But in fact it was taken lower and there was no need to storm this obstacle. In many ways it was a game of chance and taking the point mostly depended on the side one or another crew was coming. Fortunately Eduard Nikolaev’s crew passed this point almost without a delay. However, other Kamaz trucks lost time there. First Anton Shibalov stopped to get the stuck Mardeev’s truck out of the sand. They did not have to pull the truck out with ropes, they just helped to dig and put tracks. After that Airat Mardeev’s crew continued their way. In general Airat Mardeev’s crew lost there about an hour. 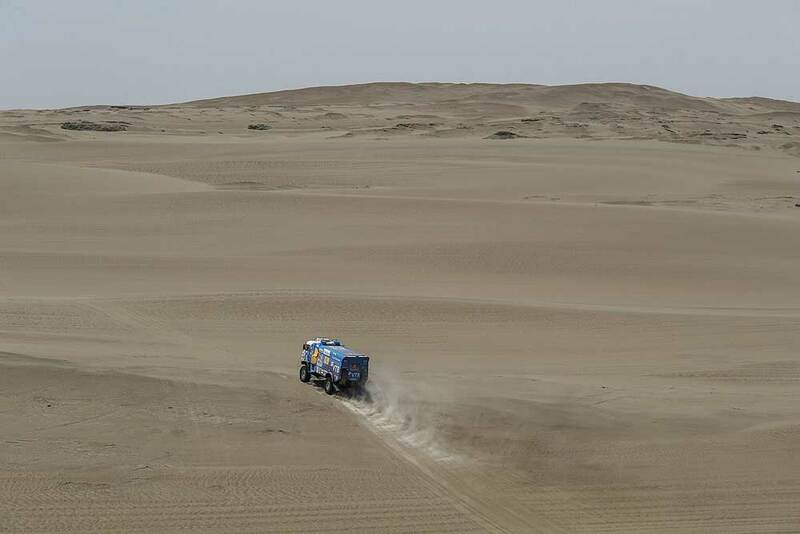 The crew, fast from the very start of the stage, also faced with a technical problem – generator broke down. Fortunately the route crossed an asphalt road (270th kilometer), where today was allowed to organize a service area and mechanics could help sport crews. However, the time loss for repair was not compensated. On the batteries Airat reached this place and then the generator was changed for a new one for nine minutes. Meanwhile the situation on the 227th kilometer evolved in its way. After helping Mardeev, Anton Shibalov had to put onto wheels fell on its side truck of Dmitry Sotnikov (it should be noted that Sotnikov came there later than others as he had to change two wheels due to the cut in a narrow mountain gorge). It took him more than an hour to put the truck on its wheels. It is noteworthy that Anton Shibalov’s crew perfectly cope with their fast assistance duties. Before the misfortunes on 227th kilometer he was driving in top-5 among today’s leaders and all further time losses were connected only with help to his teammates. Last two days Anton Shibalov always appeared in the right place in the right time. Russian rivals did not have a better situation. Almost after start the crew of the Belorussian Siarhei Viazovich stopped – turbocharger nozzle was punctured. With help of Aleksandr Vasilevsky’s crew the problem was solved. Another Belorussian crew of Aleksey Vishnevsky (by the way he was third in general standings before this third day)broke through the sump and till late evening was still standing on the route together with A.Vasilevsky who stayed for help. 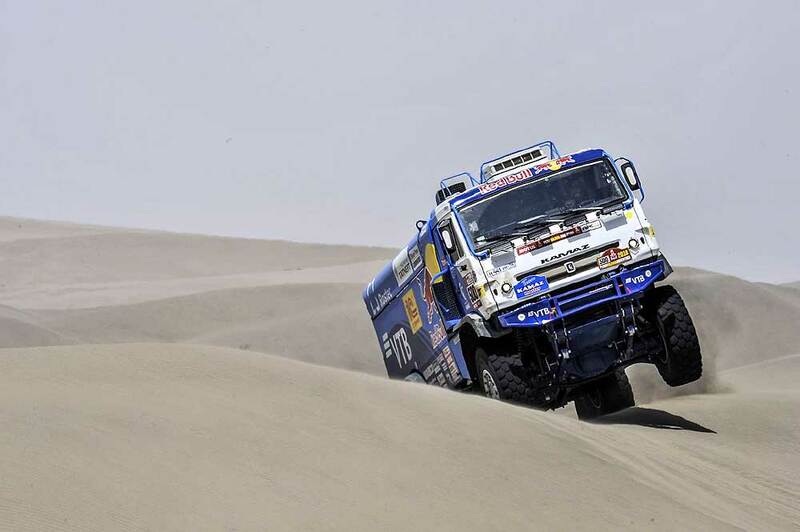 Artur Ardavichus (Iveco) broke a power steering as he bumped into a dune. The crash was so strong that navigator’s hand hold ripped off. It was informed that yesterday Martin Kolomy lost much time due to the electricity problems. Czech Ales Loprais was standing on the route because of technical problems. By the time this material was being created he had not returned to the bivouac. Therefore the reason of time loss would be known later, but according to the preliminary information he had engine problems. To complete the picture of Tuesday’s apocalypses we would add that the front suspension on Martin Van Den Brink’s Renault was broken down. Mechanics’ efforts in the service point were not successful. In order not to waste time he tried to continue driving but eventually stopped 60 kilometers before the finish. To sum it up, Eduard Nikolaev has the best time. He increased his interval in the general classification from going behind Federico Villagra up to 37 minutes. Not bad, first of all, in relation to psychological balance for further race days.